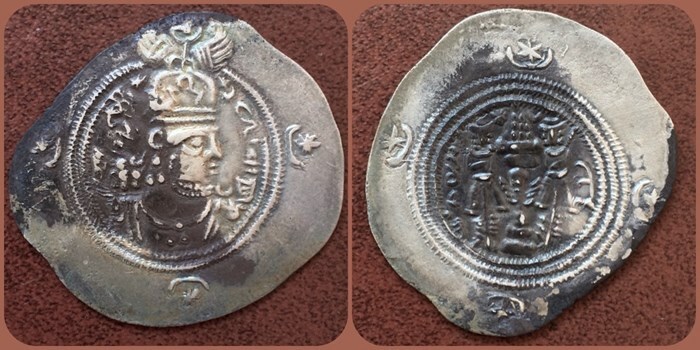 Ariana Coins | Central Asian | Sasanian | ACSAS-140, Sasanian Kings. Yazdgird (Yazdgard) III. AD 632-651 AR Drachm. Home > Central Asian > Sasanian > ACSAS-140, Sasanian Kings. Yazdgird (Yazdgard) III. AD 632-651 AR Drachm. ACSAS-140, Sasanian Kings. Yazdgird (Yazdgard) III. AD 632-651 AR Drachm. Sasanian Kings. Yazdgird (Yazdgard) III. AD 632-651 AR Drachm. 33.67mm, 3.57gm. SK (Sakastan) mint. Dated RY 17 (AD 649). “Yazdgard splendor prosperity” in Pahlav. Crowned bust right, stars above crescents on shoulder; stars flanking crown, crescent to right / RY to left, mint to right, fire altar with attendants and ribbon, star and crescent flanking flames. Gobl type II/1, Mochiri 397. Toned good very fine.